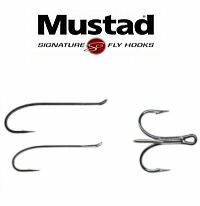 Double Hooks - Short-shafted, down-eye double hooks for various fishing situations. Size 4 for sunk-line fishing in slow water. Sizes 6-12 for float-line fishing in faster, oxygenated water. 10 per package. Sizes: 4-12. Double Tubes - Short-shafted, straight-eye tube-hook built according to the same principle as the double salmon. 10 per package. Sizes: 4-12. Super Quality-Out point & wide gape for secure hold. Traditional black japaned. 25 in a pack.